What is Kohlrabi? Have you heard of it? Through making this delicious, creamy Coconut Kohlrabi Lemon Soup, we’ll learn all about this unique and delicious vegetable, which is predicted to be big in 2018. As it’s gaining in popularity, we’re seeing more and more recipes with Kohlrabi. If you’ve been following Cooking On The Weekends for a while, you know that I often attend media events at Melissa’s Produce. From cookbook authors and restaurant chefs, to produce experts and food stylists, it has all greatly enhanced my culinary education, and most importantly, it’s kept me current in our always changing food world. I especially look forward to an annual presentation about produce trends in the new year. I began last year with a hot 2017 trend, the Shishito pepper. And this year I’m starting with Kohlrabi, which is predicted to be one of the top ten specialty vegetables of 2018. 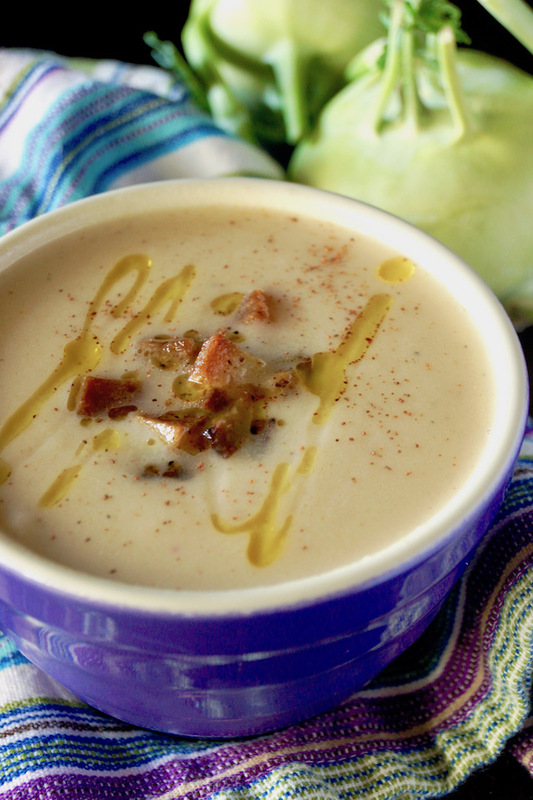 I’m introducing it through a luscious, rich and creamy Coconut Kohlrabi Lemon Soup. And in a couple of days we’ll be roasting Kohlrabi. I’ve been experimenting with all sorts of recipes with Kohlrabi, and can’t wait to share them all with you. The is a delicious and versatile vegetable — but, you might wonder what it is if you haven’t seen or cooked with it before. So let’s break it down. Kohlrabi is a Cruciferous vegetable. Also included in this family of vegetables are cabbage, turnip,cauliflower, boy choy, broccoli, Brussels sprouts, horseradish, kale, and more. The name Kohlrabi comes from a combination of cabbage and turnip in German and Latin, respectively. “Kohl” means cabbage in German, and the word “rapa” means turnip in Latin. Though it might look like it, Kohlrabi is not a root vegetable — the bulb grows above the ground — and is actually an enlarged portion of its stem. You can find green and purple Kohlrabi. It can be eaten both raw and cooked and should be peeled before use. What does Kohlrabi taste like? Many describe the flavor of Kohlrabi to be similar to broccoli stems — I think it tastes more like a mild cabbage when cooked, and almost like a very crisp apple, without the same level of sweetness, when raw. There are many different cooking techniques that can be applied to Kohlrabi. I really love it simmered and then puréed in this Coconut Kohlrabi Lemon Soup. This is a vegan recipe and yet it’s still incredibly rich and creamy! I always love fresh lemon and coconut together, and they seemed like a natural paring with the Kohlrabi, which can easily take on some of the other flavors, while still holding its own. The soup has a mild cabbage flavor with a bit of tartness from the lemon and the coconut milk balances everything together perfectly. The fresh herbs and touch of nutmeg warm it up, making it a very comforting bowl of soup. I also adore Kohlrabi roasted at a high temperature or sautéed — these methods will bring out a lot of sweetness from caramelizing. It can also be steamed or fried. So what is Kohlrabi? A super cool, unique, versatile and tasty vegetable! The next time you see it in the market, I hope you grab a few. And then try this lovely Coconut Kohlrabi Lemon Soup, which is the first of a few recipes with Kohlrabi I’ll be posting here this year. A delicious vegan soup that's full of fresh flavors, and is as creamy as can be, without cream! Trim the stems off the Kohlrabi and the peel them — either with a vegetable peeler or a paring knife. 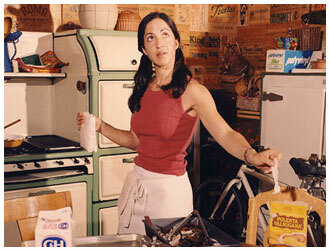 (You can save the stems for another use, like making vegetable stock.) About 1/2-inch should be cut off each end, and then roughly chop them into approximately 1-inch cubes. These do not have to be pretty as they well be puréed later — the important thing is that all be about the same size, so they cook evenly. Remove about 1 cup of the chopped Kohlrabi and cut into a smaller dice. Set both aside, separately. Coat the bottom of a large pot (approximately 4 quart), with olive oil and place it over medium-low heat. Add the onions and garlic and cook until soft, about 7 minutes. Then add the roughly chopped Kohlrabi (not the smaller diced), to the pot and stir to blend. Mixing often, saute for about 7 minutes. Add the wine, lemon juice, vegetable stock, thyme sprigs and bay leaves to the pot, and stir to blend. Turn the heat to high and bring to a boil. Then, cover the pot, turn the heat to low, and let it simmer until the Kohlrabi is soft, about 40 minutes. While the soup in simmering, coat the bottom of a small sauté pan with olive oil and place over medium-high heat. Add the small diced Kohlrabi and stirring often, cook until soft and golden, about 5 minutes. Season with salt and pepper, and set aside. Serve each portion of the soup with a few pieces of the small diced, sautéed Kohlrabi on top with a drizzle of olive oil. This recipe serves about 8 as an appetizer, and 4 as a main course soup. OMG this looks fantastic. I can’t wait to try it. I have been researching kohlrabi recipes and so happy to find this one. Looking forward to your future kohirabi posts. I haven’t made kohlrabi soup, but yours looks creamy with addition of coconut and lemon perfect for this cold harsh winter. Oh I love kohlrabi! I roast it in the oven with just a little olive oil and sea salt and eat it as is. I think it would be spectacular in soup though, so I am down to try this soup right away! That is a great idea to use coconut milk to achieve a creamy consistency and still keep it vegan. It sounds amazing. I love soup this time of year! Thank you Scarlet! I hope you try it sometime. Wow so much flavor going on… wine, lemon, coconut, LOVE it! I make an apple and raw kohlrabi salad that my family enjoys, but have yet to try in cooked. Winter storms on the way means soup at my house, a perfect time to try something new with kohlrabi! Thank you Deb. I bet your salad is fantastic. It actually reminds me of a crisp apple (minus some of the sweetness), when it’s raw. What a great combination that must be. This soup looks so delicious! I love creamy soups and I cannot wait to give this one a try! I hope you love it, Patty! A soup like this would be perfect for a cold evening here in Boston, bet my family is going to love this! When I was in college in the 70s, we used slices of kohlrabi as a vehicle for dips. I have not had it cooked, though, and am now curious about this side of the vegetable. The soup sounds fantastic, Valentina! I love the sound of this, kohrabi is really popular and not uncommon to find here in central Europe. I’ve never paired it with coconut though, looking forward to trying this. I’m a huge fan of Kohlrabi … but I seem to always make it the same way. I tried this recipe tonight and it was a huge hit! So creamy and so bright with the addition of the lemon. I’ll make this again and again!